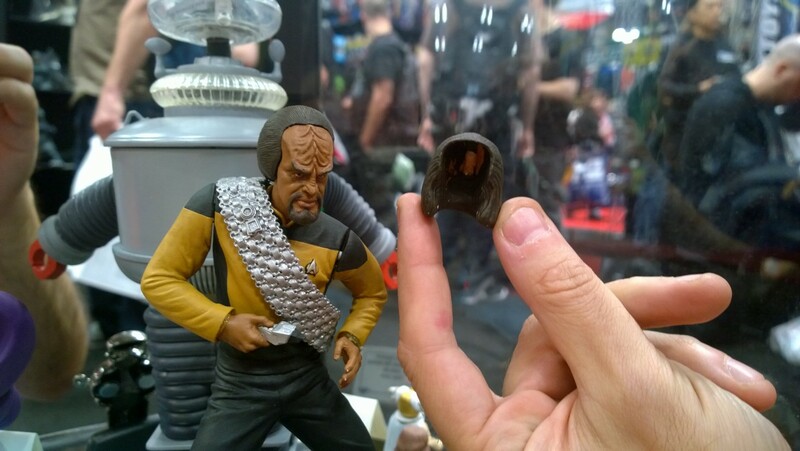 At the New York Comic Con over the weekend, DST were showing off their wares, including the first look at the next entry in their Star Trek Select range of action figures, Mr Worf. 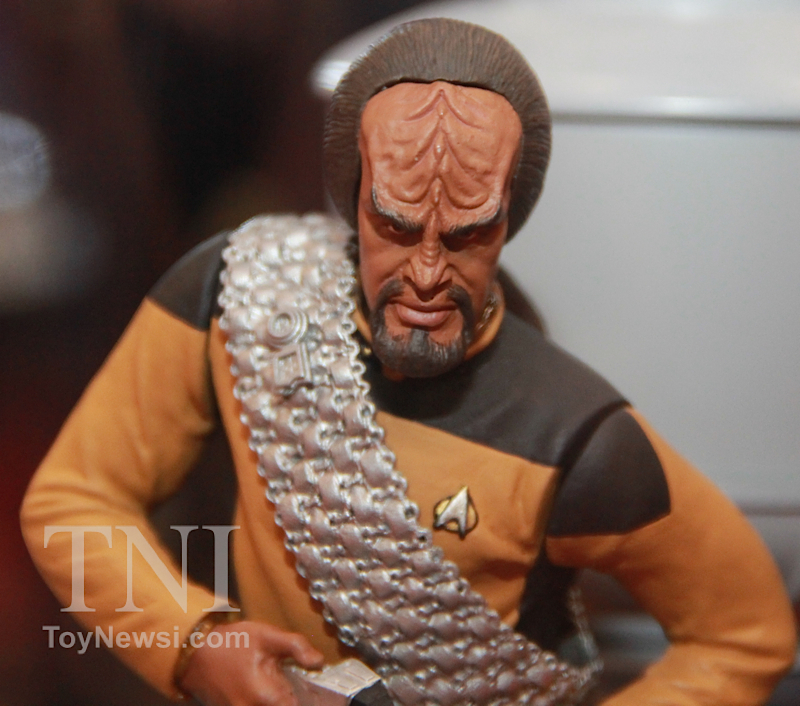 On display was a prototype, which demonstrated how the new Worf will, as is typical of figures in the range, be part sculptural, and part poseable, and feature a range of interchangeable parts to allow you to display as desired. 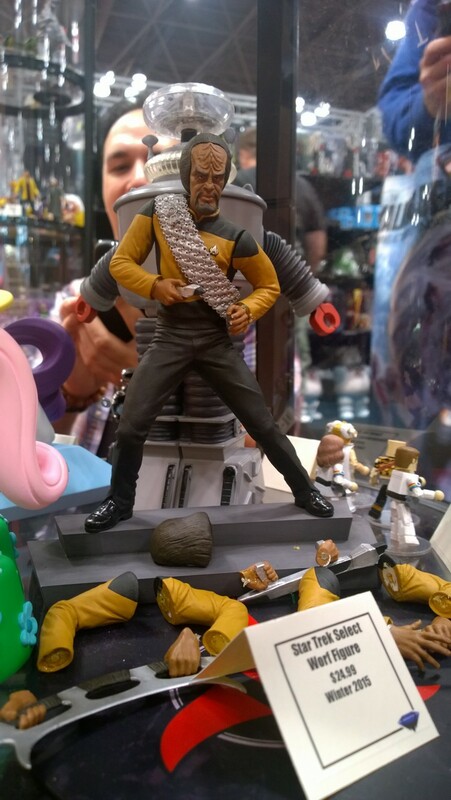 As well as a base, the Worf figure will come with an assortment of weapons, and different, suitably posed, arms to hold them, plus interchangeable hair! TrekMovie and Toy News International were there to take photos, and you can see many more in their respective galleries, in addition to the ones I've picked out here. Worf will be the fourth Star Trek Select figure, following the already released Captain Picard, and first TOS pairing, Kirk (with Khan) and Spock (with the Horta). There's some time to wait yet though, as DST aren't expecting Worf to materialise until winter 2015. I just do not like this line. Why not just put some decent articulation in these figures? Worf looks like he's doing the Cha Cha Cha on some cheap Saturday night dancing show! And why oh why oh why does he come loaded with spare arms??? Awful figure, soft sculpting across this line, blotchy paint work and poorly conceived. The day DST loose this licence will be a good day. I'd love to see NECA take a crack at it really and actually put some product out there based on the new movies as well. I'm getting sooo fed up with Diamond Select (and CBS). Their Trek line has gone from bad to worse with many of their products feeling rushed even though it takes them years to get anything out. When you think about how much excitement Eaglemoss has generated among the fans of that line by revealing ships not due for release for another year or so. QMx as well doing a great job in keeping fans interested in not just Star Trek products but them as a company by having a brilliant and enthusiastic team. However, if [CBS] you're going to continue to miss opportunities to develop and expand this franchise beyond this piecemeal approach CBS seem to be taking with it then what do I expect.